The two commands were initially camped alongside each other as though they were one regiment in the large infield of the one-mile race track at Kapiʻolani Park. The initial camp at the race track was unnamed; it was later called Camp McKinley. It was a temporary encampment. The US government looked for land for permanent facilities. Of the two major tracts of land assigned to the War Department (Kahauiki and Waiʻanae-uka,) a board of Army officers in 1903 recommended establishment of the principal infantry post at Kahauiki. First, they started construction of officers’ quarters and battalion barracks around Palm Circle, as well as support facilities on and near Funston Road. Palm Circle (earlier called the 100 Area and later named for the 200-royal palms along its edge) has a large, grassed oval parade ground. Fifteen two-story, officers’ quarters line the north and east sides of Palm Circle Drive which encircles the parade area. Along the southern side of the drive are former enlisted men’s barracks, now converted to administrative offices, and other administrative buildings, including a swimming pool. The initial structures were completed June 22, 1907, with more by 1909. A post hospital was built across King Street, in the area now occupied by the Fort Shafter interchange of the Moanalua freeway. Streetcars ran from downtown along King Street; the route originally ended at Fort Shafter, and was eventually extended to Pearl Harbor. The streetcars ran until 1933, when the current post bus route was established. A railroad line ran from the Middle Street gate, across Shafter Flats and down Puʻuloa Road. During World War I, all regular Army Field artillery and infantry regiments were transferred to the continent, leaving between December 1917 and August 1918. To replace the troops, one battalion of the 1st Hawaiian Regiment of the Hawaiʻi National Guard was stationed at Fort Shafter in June 1918. A regimental officer’s school was established July 1918 at Fort Shafter and Schofield Barracks. Food gardens were planted on the post. The National Guard regiments were demobilized in 1919, leaving the Post vacant except for the 9th Signal Service Company. 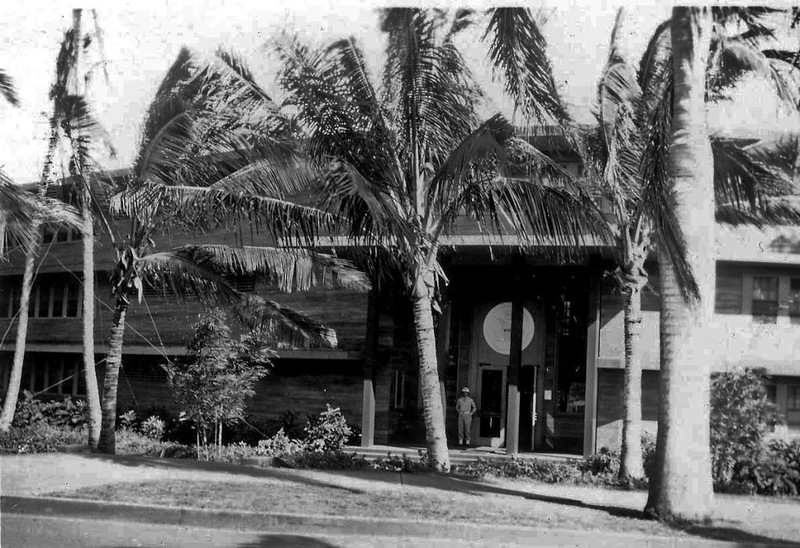 In June 1921, the Headquarters of the Hawaiian Department moved to Fort Shafter from the Alexander Young Hotel in Honolulu. Since then, Fort Shafter has been the base of the senior Army headquarters in Hawaiʻi. Gradually converting the original troop facilities into administrative space, the headquarters organizations occupied the Palm Circle area. From 1921 through World War II Fort Shafter was also the antiaircraft artillery post. The Hawaiian Coast Artillery District was located at Fort Shafter from June 1921 through October 1929. Only a few casualties occurred at the post in the December 7, 1941 attack, from US Navy antiaircraft shells rather than Japanese planes. Palm Circle was strafed during the attack. World War II saw significant increase in building activity at Fort Shafter, in every area where there was space. Buildings were also expanded and remodeled during this period. From 1943 to 1945, Richardson’s command carried out logistical planning for the invasion of the Gilberts, Marshalls, Marianas, Guam, Palau and Okinawa. After Tripler Hospital moved to its new hillside farther west in 1948, and after the Moanalua Freeway was cut through a portion of the old site in 1958-60, the remaining hospital area was redeveloped with enlisted housing. The image shows the Pineapple Pentagon (Richardson Hall) at Fort Shafter (1940s.) In addition, I have included other images in a folder of like name in the Photos section on my Facebook and Google+ pages.